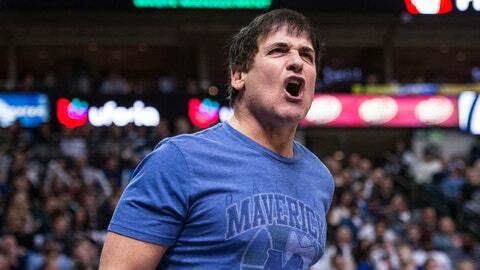 Mark Cuban has owned the Dallas Mavericks since 2000. DALLAS (AP) — Mark Cuban thinks the next Kevin Durant would be better off in the NBA Development League rather than the college of his choice. The outspoken Dallas Mavericks owner said he can envision scenarios where the country’s top basketball prospects would get drafted and play in the D-League rather than spend one season at an NCAA school. Cuban said there’s no reason for a player to attend college as a freshman "because he’s not going to class, he’s actually not even able to take advantage of all the fun because the first semester he starts playing basketball." The billionaire owner said his idea is not yet a well-researched proposal, just an opinion. He said agreements with colleges could still give players a shot at an education. "A major college has to pretend that they’re treating them like a student-athlete," Cuban said. "It’s a big lie and we all know it’s a big lie. We can do all kinds of things that the NCAA doesn’t allow schools to do that would really put the individual first." Durant, far from the only "one and done" player in the NBA, was a star for one season at Texas before Seattle drafted him No. 2 overall in 2007. The franchise moved to Oklahoma City a year later, and now Durant is a three-time scoring champion and the league’s current scoring leader. The minimum age for D-League players is 18, a year younger than the NBA rule that was implemented in 2005, two years after LeBron James made the jump straight from high school to the NBA. New NBA Commissioner Adam Silver said recently he wants to change the age minimum to 20, and Cuban said he would prefer to make it 21. With a higher age limit in place, Cuban said he would like to see some sort of supplemental draft for the D-League. Cuban said there’s "no question" players would develop better in basketball terms in the D-League, and he believes rules could require life skills or educational training "so you couldn’t skate." He would also want to guarantee tuition payments for players who don’t make it the NBA. "We can get rid of all the hypocrisy and improve the education," Cuban said. "If the whole plan is just to go to college for one year maybe or just the first semester, that’s not a student-athlete. That’s ridiculous."